This picture taken from Jusco Mid Valley Tomica section, as you can see the whole rack is like overturned. I guess the previous person has searched through the rack thoroughly, but he walked away with the messy left to other collectors or the storekeeper. By looking at the situation I did not continue my search, but I just can’t understand why there are still selfish people around, feel shame if they are Tomica collectors. Don’t you agree? Aww man... this is terrible! I was once with the staff who was arranging them, they take a LONG time to clean up the mess. I kesian the lady so much I helped her arrange. Took ages though. 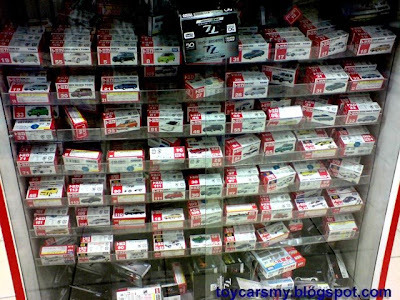 Should catch those responsible for such things... -_-"
In Singapore some of the Tomica cabinets are open without any glass and lock and you can choose your cars without asking the shop assistant to open the cabinet. Some even hang the Choro-Q on open racks (Takashimaya) or placed on the shelves (Isetan Singapore)! They are not worried about ppl stealing the Choros or Tomicas! Even the open cabinet ones the Tomicas are well arranged and not all over the place like in the photo. Says alot about the mentality of the collectors there compared to here. Also maybe Singapore law and police is much much stricter. Yup, I totally agree with u. I hate it when I come across toy cars display like that some time when I'm in good mood, I'll help to rearrange it. I just started my toy car blog call PJ Toy Car. Hope to promote this hobby.